The Kid works at a restaurant that sells a mile high carrot cake with cream cheese frosting. They have it sitting on the counter right by the cash register to entice customers to buy a slice. Since she has a dairy allergy, she hasn’t been able to try it but that doesn’t stop her from having to smell it every time she plates one. For Christmas, she asked me to make her a carrot cake so she could try it. The kicker, besides being dairy free? She hates carrots, raisins, nuts, coconut… LOL. Hmmm, challenge accepted. It’s pretty easy to leave out most of the mix-ins that some people put in their carrot cake like raisins and nuts. 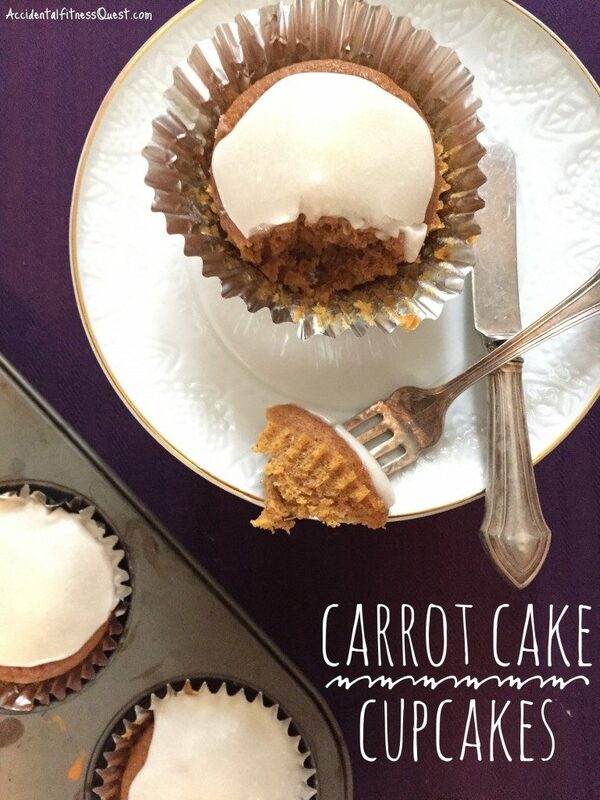 It’s a little more difficult to leave out the main ingredient of the cake – carrots. So I got a little sneaky with this one. I used baby food carrots since they are pureed beyond any hint of a carrot shred or lump. It just so happened that two individual containers were the perfect amount to dump in here, and The Kid never knew they existed. I also decided to make them into cupcakes so that I could freeze leftovers if needed. Preheat your oven to 350 degrees and line 12 muffin cups with paper liners. Combine the almond milk and vinegar in a small bowl and set aside to curdle. In a large bowl, add the sugars and butter and mix until fluffy. Add the egg, vanilla and baby food and beat to combine. Measure the dry ingredients and add slowly to the wet mixture, stirring to combine. Pour in the almond milk and stir to mix. Don’t overbeat, but just mix until the almond milk is blended in. Fill prepared muffin cups about 2/3rds full. Bake at 350 degrees for 14-16 minutes. Remove from oven and cool before frosting. Makes 12 cupcakes at approximately 119 calories each (without frosting) – 3g protein, 20g carbs, and 3g fat. Beat the cream cheese, butter, and powdered sugar until light and fluffy. Add a dash of vanilla, if desired. Spread evenly on cooled cupcakes. Makes frosting for 12 cupcakes at approximately 79 calories per serving – 13g carbs and 3g fat. I thought about making these cupcakes vegan and leaving out the egg, but since I was already going with a lower fat modification I decided not to risk drying the cupcakes out for Christmas dessert. You can try subbing in a flax egg or other vegan egg substitute to make them vegan if you like. The cupcakes were so tender and moist even without all the oil and butter in traditional carrot cake. The Kid thought they were great and never suspected the most-hated ingredient was in there. If you’re making these for someone not quite so picky, feel free to use shredded carrots, raisins, nuts or other common carrot cake ingredients. Happy cupcaking and Happy New Year!